Captain Marvel is out in movie world earlier with lots of awesome actions along with the special edition of Adidas newest colored sneakers known as the Captain Marvel shoes. 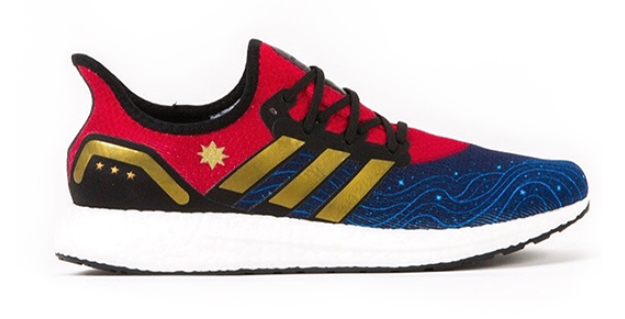 Adidas AM4 has three colors to choose red, blue and gold - designed by Bartel, special for Captain Marvel movie. If you haven't seen the movie and if you wanted to gear up to have a complete experience, here's a good idea for you. Jen Bartel said that she wanted to create a design that was extremely wearable but unique and still had some elements of illustration work. Captain marvel shoes is set for release at nationwide Foot Locker stores on Friday, March 8 in the US. But, don't worry guys international shipping will be soon available.